Happy Monday! Firstly, I have to thank you for all your lovely comments on my 3 Year Anniversary post. I was so touched to read your thoughts and memories. I can promise you there lots more exciting things to come to the workroom over the NEXT three years (and more!) and the reason we do it, is for you. I drew two random numbers this morning for the $50 class gift card prizes and the winners are #36 – Pam B and #29 Loren K!! Next, I wanted to tell you about something new we’re starting at the workroom. A crafty gift registry! Most of you will be spending the next few months thoughtfully hand making gifts for the people you love. 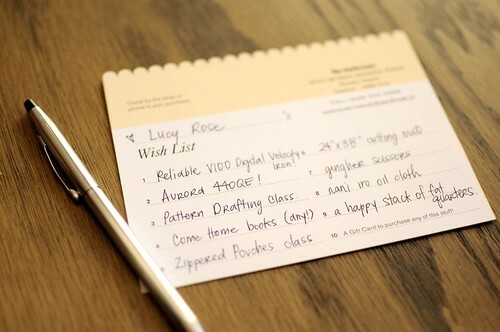 Make it easy for your friends and family to buy you the perfect thing by filling out one of our Wish List cards. We will keep your card on file and assist anyone looking to buy you something from the shop. We will also cross off items that have been purchased for you to avoid double gifts. Feel free to take a few extra cards, if you’d like to hand some out directly or casually post one on your fridge door. (hint hint!) The registry is not just for the holidays, this is a year-round registry – birthdays, weddings, Valentine’s Day, National S’mores Day, etc. Purchases from your Wish List can be made over the phone to make it even more convenient. the workroom Wish List was created from your suggestions and comments. It’s a great idea, so thank you for asking for it! We think you’ll have a lot of fun filling out some dream gifts from the shop. This is the best news ever! I’ve been wracking my brain for our registry – because we really don’t need anything house-wise. He has Best Buy and Lowes… I have the Workroom! national s’mores day! why have i not celebrated this yet? ?